This was posted on MSE originally. Please note that my only training in programming of any kind is in the context of mathematics, specifically group theory. Thus, please use minimal technical language. I'm trying to get GAP on my Android phone. 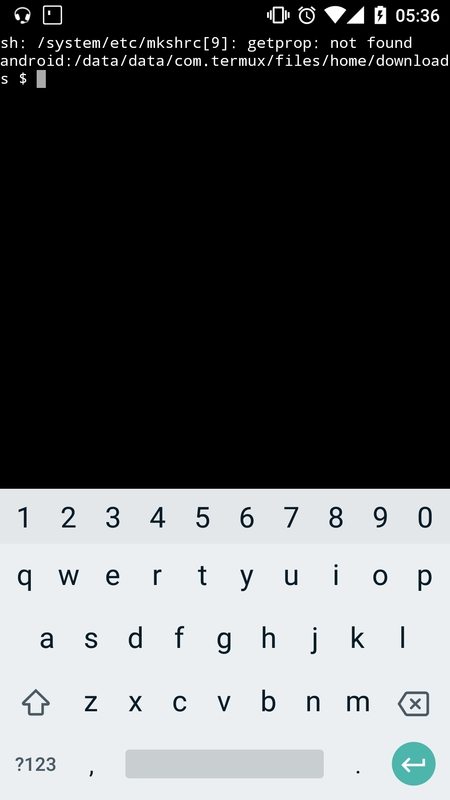 I found on the GAP forum that someone called Matan Ziv-Av compiled a version of GAP for Android that can be found here (and more specifically here). This explains something I don't understand. I have downloaded the latest file, last updated in 2015 (so it's gap4r6), but, upon opening it with RAR, I have been unable thus far to run the programme. This is how I got it to run. Preparations: In termux type termux-setup-storage when prompted to give termux storage permission select allow. This is to give access to the sdcard in termux. Make sure your connected to the internet. In termux, type pkg install wget press enter. Now to download the file type wget my.svgalib.org/android/gap4r5-1.tar.gz then hit enter. Extract the file type tar -zxf gap4r5-1.tar.gz hit enter. Type cd gap4r5 hit enter. Now we need to make a couple of changes to the script for it to run on termux. We will copy it to the sdcard Download file to be able to edit it. type cp gap.sh /storage/emulated/0/Download/ hit enter. Now open the file gap.sh in a text editor, I used Notepad++ for Android. This file is in your Download folder. Go back to termux and type cp /storage/emulated/0/Download/gap.sh . (the period at the end is important) and hit enter. Now you are ready to start using the program. to run the program make sure you are in the folder gap4r5 and type ./gap.sh. (To get to this folder when you start termux type cd gap4r5 or wherever you are in termux type cd hit enter and type cd gap4r5 and hit enter). 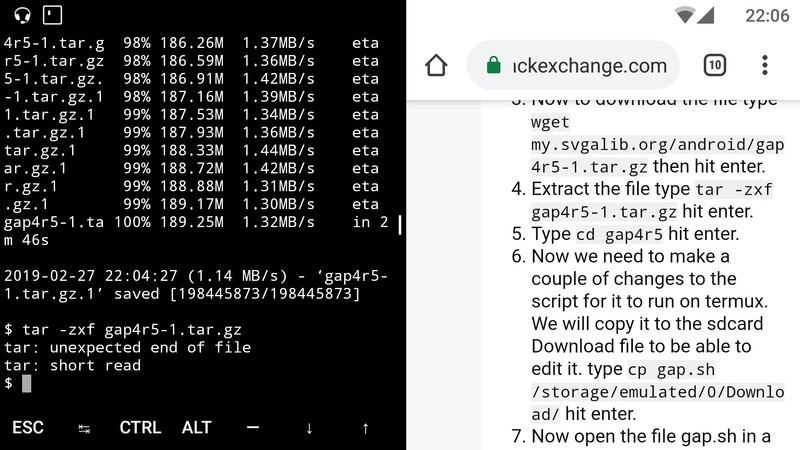 Since GAP is open-source you can download the sources and compile them on device in termux or another terminal emulator (though other terminal emulators don't provide the compilation tools AFAIK). There are quite detailed compilation instructions in the "README.buildsys.md" file in the gap source directory, have a look at that for some more details. Here are the steps I did to compile it (after opening a termux shell), lines starting with "#" are comments and are hence suppose to help you understand what the following line(s) does. Please let me know if you run into any errors (I might have missed some dependencies) or if I should explain something in more details. Also note that you have to compile and run gap from termux's folder structure (/data/data/com.termux/files/), android doesn't allow executable files in the shared storage (like the external and internal sdcard). Not the answer you're looking for? Browse other questions tagged installation gap-software or ask your own question. Why is there such a difference in the amount of internal memory? How do I install one Android phone's apps to another Android phone without rooting?